Providing you the best range of coriolis component of acceleration with effective & timely delivery. Owing to the rich industrial experience, we have been able to offer high-quality Coriolis Component Of Acceleration to our esteemed customers. This apparatus is commonly used for studying the deflection of moving objects when they are viewed in a rotating reference frame. 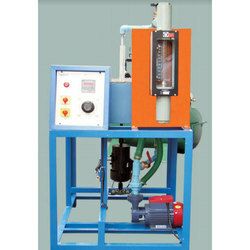 Due to the hassle free installation, the offered apparatus is highly appreciated in the market. Looking for “Rotameter Apparatus for Laboratories”?